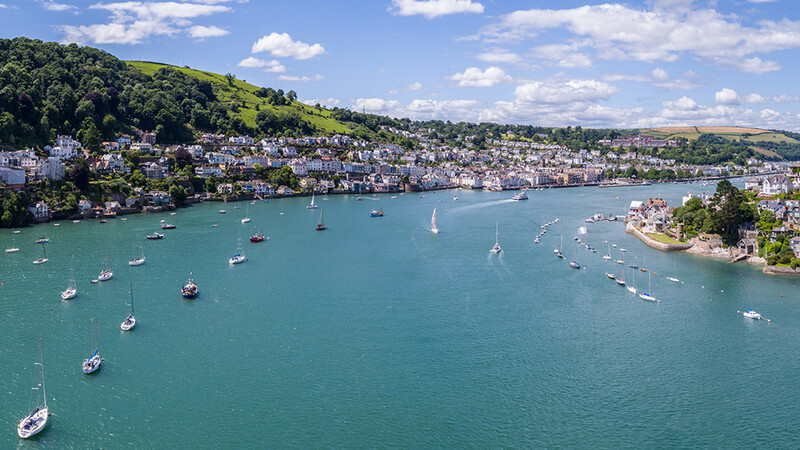 On the wooded slopes of the Dart Valley – where the river meanders past old slipways, ship quays and harbour walls – lies the ancient port town of Dartmouth, home to some of our most handsome holiday cottages. This bustling maritime community is steeped in history, a story to be told at every twist and turn of its narrow Elizabethan streets. Built to repel not only the advances of Spanish and French marauders, but also to protect the town’s notorious privateers, the narrow estuary mouth has been guarded by Dartmouth Castle for more than 600 years. On the hillside, overlooking the harbour waters, stands the impressive Britannia Royal Naval College, one of Dartmouth’s most iconic buildings having housed a succession of young royals as they embarked on their military training. Today, the streets of Dartmouth are lined by an array of artisan shops, boutiques, galleries, bistros and delicatessens. The weathered flagstones on Old Market Square have played host to traditional farmers’ markets since the early 1800s, a place where you’ll find a variety of handmade wares, crafts and homegrown fayre. During the summer season, the town’s already busy harbour becomes even more active with yachts and pleasure boats all sailing and into port alongside Dartmouth’s diminished but long-standing fishing fleet. 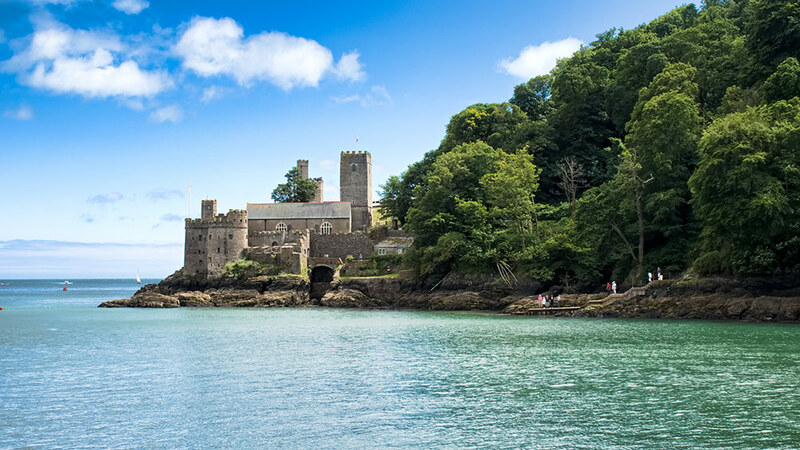 Described as ‘one of the most beautiful fortresses in England’, the narrow passages, gun rooms and ramparts of Dartmouth Castle provide an exciting family day out, just a short stroll from Dartmouth Harbour, passing the iconic Bayards Cove Fort along the way. The views here are magnificent and stretch from neighbouring Kingswear Castle to the gleaming waters of Start Bay. Dogs are welcome on leads. Step back in time to discover Dartmouth’s rich nautical history when you pay a visit to the town’s fascinating museum, where you’ll get a real sense of what life was like through the centuries in this characterful old port town. Look out for the impressive ship model arrangement in the King’s Room, some of which are encased in impossible bottles. 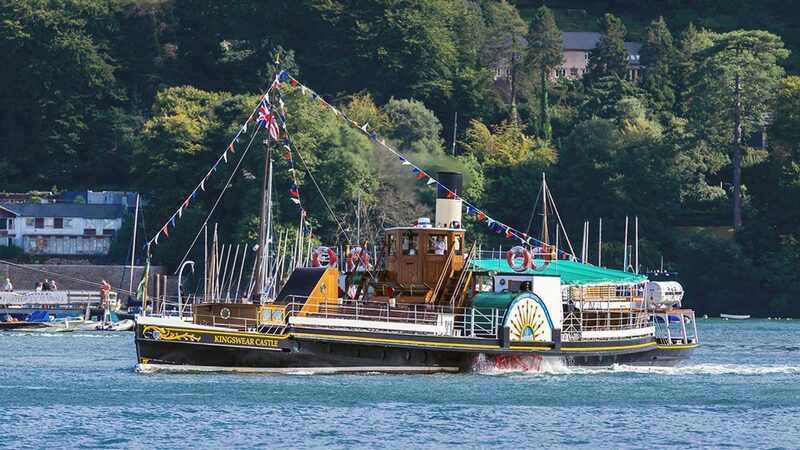 Enjoy a vintage, steam-powered day trip exploring the Dart Valley on both land and water. It’s all aboard the Dartmouth Steam Railway to follow the riverside track as it steers towards the rolling South Devon hills bound for Paignton. 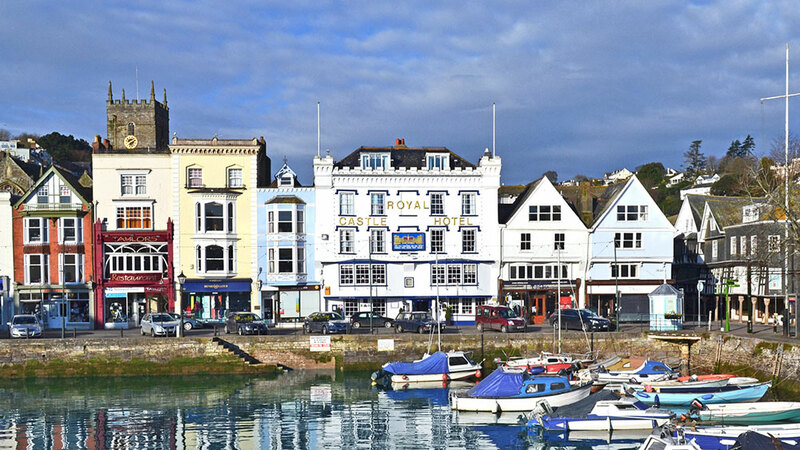 A round-robin ticket will take you on a bus trip to the picturesque market town of Totnes, where you’ll then embark on a riverboat cruise back to Dartmouth Harbour. You can also opt for the nostalgic paddle steamer cruise aboard the magestic Kingswear Castle, once considered the ‘lifeblood of the river’ ferrying up to 500 passengers at a time. Well-behaved dogs are very welcome for a small extra charge. Enjoy a leisurely stroll around Dartmouth Quay to discover the beautiful horticultural displays at the Royal Avenue Gardens. Originally a recreation ground for bonfires and fairs, this much-loved setting contains a sweet-smelling rose garden, a bandstand, a community greenhouse and a variety of Mediterranean and tropical plants that thrive in the milder climes of South Devon. The gardens also provide the setting for the main stage of the annual Dart Musical Festival. Take to the river courtesy of Dartmouth Boat Hire. From small fishing boats to cosy cabin cruisers, what better way to discover these beloved estuary waters. Dartmouth and the surrounding coastline remain a constant source of inspiration for artists. As you explore the pretty old town streets you’re bound to stumble across one of the many art galleries and artisan shops. The harbourside Dart Gallery is well-established on contemporary art scene. Baxters is one of the most curious and imaginative shops in town, filled with inspirational artwork, printmaking, crafts and jewellery. Famous for his quirky quips and poetic puns, illustrator and cartoonist Simon Drew has helped run a gallery in Dartmouth since the early 80s. Pop into his premises for a presentation of highly original artwork, including ceramics, crafts and greeting cards. The Flavel Arts Centre is the cultural hub of Dartmouth and runs a packed schedule of box office blockbusters and riveting live performances, from stand up comedy to classical music, as well as the town’s library and a variety of workshops. Dartmouth’s boating community continues to be one of the town’s most buoyant mainstays and the harbour waters stage a multitude of sailing events throughout the year. Dartmouth Yacht Club are always keen to welcome new members and run various taster sessions for visitors. The neighbouring village of Kingswear is home to the Royal Dart Yacht Club who also oversee a packed sailing calendar. Every year, they team-up to help run Dartmouth Royal Regatta, an event which dates back to 1822. Today, the regatta attracts visitors in their thousands, all gathered to enjoy a jamboree of events on both land and water. If it’s some relaxation that you need, then a bag of fish ‘n’ chips and a harbourside bench to watch the boats idle by remains one of Dartmouth’s most popular and simple pleasures. Check out the Wheelhouse or Rockfish Takeaway. A short drive out of Dartmouth takes you to the prestigious Dartmouth Golf Course, where you’ll find the pristine greens of the par 72 18-hole championship course and a beautifully presented 9- hole sister course. Nearby is one of the West Country’s premier family days out. Full of rides and slides, animal zones and action-packed activities, Woodlands Family Theme Park is a place where little ones can run wild surrounded by gorgeous Devonshire countryside. Travel along the coastal road towards the neighbouring estuary town of Kingsbridge to encounter some of the South Hams’ most beautiful beaches. 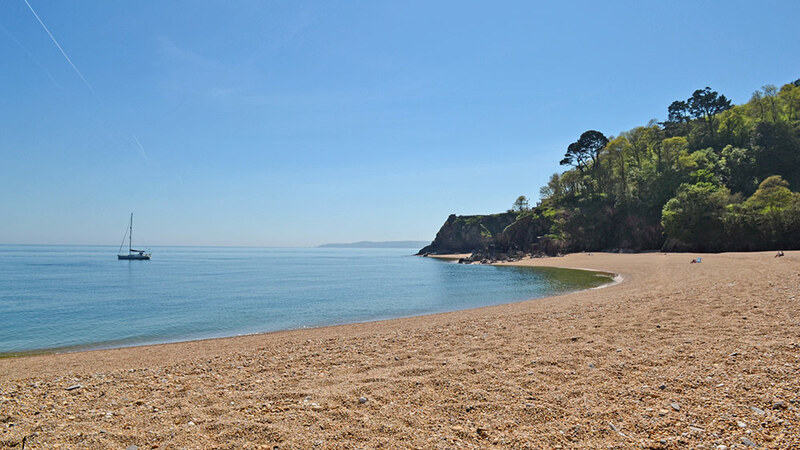 Slapton Sands is a gorgeous three-mile shingle stretch along Start Bay, popular among anglers, dog walkers and swimmers. Westwards lies the picturesque fishing village of Torcross where you can enjoy a fine pub lunch at the Start Bay Inn. At the eastern edge of the shingle bar lies the more sheltered Strete Gate Beach. Follow the South West Coast Path eastward and you’ll reach the exquisite beach of Blackpool Sands, famous for its aquamarine waters. This sparkling bay, now a popular setting for paddle-sports, is served by the Venus Café, one of the best places to eat breakfast in the South West according to The Guardian. Near the mouth of the Dart estuary, you’ll find Compass Cove, a quiet, secluded beach below a stretch of headland known locally as ‘Little Dartmouth’. Closer to Dartmouth Harbour, you’ll discover one of the town’s secret coves flanked by craggy rocks with views across the water towards Kingswear Castle; Sugary Cove is a lesser-known fisherman’s haunt backed by a grassy area that’s ideal for picnickers. Dartmouth is surrounded by coastal paths, woodland rambles and river walks. Walk in the footsteps of buccaneers, pirates, admirals and kings when you take up The Dartmouth Town Trail, a mile long walk through the town’s history-steeped streets to unravel centuries of civilisations, from the mudflat traders of the Neolithic to the Norman conquerors who built Townstal (‘homestead on the hill’), the hilltop suburb of Dartmouth. The Dart Estuary Walk is a challenging five mile yomp through the narrow streets of Elizabethan Dartmouth towards the headland of Little Dartmouth with magnificent views at every waymark. You’ll pass Bayards Cove where Richard the Lionheart’s fleet launched for their Third Crusade and where the Pilgrim Fathers landed before setting sail for the New World. The Diamond Jubilee Way is a three-and-a-half-mile route on the outskirts of Old Dartmouth waymarked in the shape of a diamond to help commemorate the 60th anniversary of the Queen’s accession to the throne, which fittingly embraces some of the town’s most spectacular vantage points. Dartmouth has welcomed wayfarers and seafarers to its streets and shores for centuries, with the heartiest of greetings from the local taverns. Today, the hospitality in Dartmouth remains as vibrant as ever. Standing handsomely on Dartmouth Quay is the iconic Royal Castle Hotel. Here, you’ll find The Harbour & Galleon Bars, popular with both locals and visitors who can enjoy either the charm of a traditional English pub, or a stylish lounge bar. Expect a warm welcome, craft beers, cocktails, and a cosy log fire during the winter, plus regular jazz afternoons and music nights. Tucked away in Dartmouth’s ‘old town’ is the Bayards Cove Inn. Combining stylish décor with original period features, guests can enjoy swanky menus, a range of Devon ales and a Spanish twist with jugs of Sangria and authentic Tapas dishes. With its trendy ‘downtown’ feel, Bellini’s Bar will add a little sparkle to your night on the tiles. Ideal for pre or post-dinner drinks, this voguish venue has a great selection of beers, spirits, wines and cocktails, as well as regular DJs. The Cherub Inn is the oldest building in Dartmouth, dating all the way back to 1380. Diners can enjoy a delicious á la carte menu beneath its venerable ship’s timbers – well worth a pilgrimage. Café Alf Resco has been touted by The Guardian as one of the best places to eat breakfast in the South West. Whether you’re sitting in the sunny courtyard with a mug of freshly ground coffee or listening to some live Spanish guitar riffs in anticipation of Alf’s freshly caught seafood platter, you’ll love this delicious alcove. If your taste buds are a little more cosmopolitan, you’ll love the French flair of Saveurs. Bread, viennoiserie and fine patisserie are all handmade using traditional baking methods and Normandy flour. From breakfast and lunch to exquisite light bites, expect plenty of ohh la la when you sample some of the most delectable fancy fayres in the South Hams. Smith Street Deli is another of the town’s little treasures. The shelves are chock-a-block with gastronomic delights and the charming café room invites you to sit down and choose from a tempting homemade menu. A window seat at Bushell’s Riverside Restaurant is perhaps the hottest ticket in town. Positioned on the South Embankment, this stylish harbourside restaurant boasts stunning views of the River Dart with a sensational menu to match. Another riverside outlet with a reputation for memorable gourmet dishes is The Seahorse. Specialising in seafood, the chefs only fillet the freshest of fish, the majority of which are landed on local shores. Rockfish Dartmouth is another seafood restaurant of high repute. The spacious downstairs dining area is complimented by a sunny upstairs terrace. The annual Dartmouth Food Festival offers the ideal opportunity to experience some of the culinary delights that have made this famous port town a mecca for foodies. With more than 120 hand-picked exhibitors, workshops, demos, tasting sessions and an exiting line-up of award-winning chefs and restaurateurs, this outstanding October event is not to be missed. Experience one of the UK’s most charismatic port towns first-hand when you book a stay with Toad Hall Cottages. We’ve got a long list of Dartmouth holiday cottages, from swish riverside apartments to handsome town houses.